Mama Loves the Beach! : Let's Talk About Unmentionables . . .
'Sunny', office help . . . If you have a cat and it's indoors for any period of time it's likely you're purchasing cat litter. Cat litter has always been a bugaboo for me because of the negative impact it creates in our environment. 'Gray Guy'. . . RIP my little buddy . . . I hear you ask, "what does this have to do with the beach?" And I reply, "a lot". Cat litter is flushed down toilets, and tossed into garbage cans. The end result is that a large portion of litter eventually makes it's way into our sewer systems and storm drains which lead to the ocean. Online magazine, Green Living says that we send about two million tons of cat litter every year to the landfill. Not only is silica-based and clay cat litter bad for our environment, according Green Living these cat litters are dangerous to you and your cat. CLICK HERE to read more. Yahoo! Green writes, scientists from the UC Davis School of Veterinary Medicine found that 62% of dead sea otters found between 1997 and 2001 were infected with Toxoplasma. The suspected source was land-based runoff of the parasite. Landscape irrigation washes infected cat droppings from lawns into gutters, which drain into streams that feed into the ocean. Municipal sewage systems can't always kill the Toxoplasma eggs because they have a very hard, durable coating. So when the treated sewage is released into the sea it can hurt sea life as well. Let's not add to marine pollution with our kitty litter. A cleaner solution for those of us in coastal states is to keep the poop in the garbage. One very “green” thing we can do for the environment is to take trash and turn it into a useful product. Used newspapers and phone directories are big and bulky and take up a lot of space in landfills. Yesterday’s News diverts tons of this “trash” from landfills and turns it into a healthy cat litter product. Yesterday’s News® brand Pet Litter has benefits beyond the environment. It’s also 300% more absorbent than clay litter, is dust-free and doesn’t track. So cats and cat owners like it. Veterinarians like it too. Eight out of 10 veterinarians recommend Yesterday’s News for cats who’ve had surgery because the dust-free pellets don’t contaminate the surgical site. Yesterday’s News also works with the local community in southwest Missouri where the recycling takes place. The Project PetLitter is a program for the Girl Scouts of the Missouri Heartland, Inc, the council nearest the Springfield, Missouri plant. Girl Scout troops compete to collect the most used phone books each year from area businesses. In each of the past two years, the local Girl Scouts have collected 66,000 phone books. They earn service badges from Purina and AT&T, as well as other rewards. Of course, the Girl Scouts don’t do all the collecting! Purina provides recycling bins throughout the region to collect a variety of paper, from junk mail to pasteboard, from people in the community. This paper is also recycled into Yesterday’s News and secondnature® brand dog litter. “We also provide free shredding,” Aull says proudly. “Shredding services can be costly, but we provide it free to our community.” Click here to read the entire post. And, hello? who knew about dog litter?! Click here for interactive site about 'Second Nature' dog litter and house training techniques. The office 'help' is assisting with the computer . . . I'm not a big fan of Purina or any commercial pet food corporation for that matter, but when a corporation is producing a responsible product, they deserve recognition. 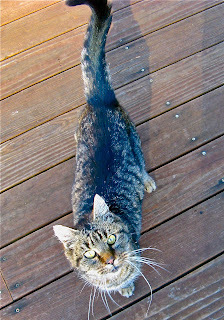 We recently switched from a corn based litter to 'Yesterday's News' because of mention on My Plastic Free Life blog, and a recommendation from our vet at Animal Hospital of Sebastopol. We eased the cats into the new litter by adding a quarter each time over several days. The transition was fairly uneventful. 1. It comes in a paper bag! All litters I've previously purchased except the plain clay litters, come in either a plastic jug or heavy plastic bag which end up in our landfill and our OCEANS! 2. Yesterday's News is100% recycled! Need I say more about this? 3. It's 100% biodegradable! I suppose if you consider the inks used on the original paper the percentage would drop. But hey, the paper was going into the landfill anyway! 4. Yesterday's News really works, I don't notice any offensive odor which is remarkable to me. 5. It's neat, do dust, little to no tracking. 6. I LOVE the clever name. Phil, the seal guy, sent an email informing us that 'Sweet Rock' died suddenly on Monday morning, April 11th. The necropsy revealed nothing unusual, leading the staff to conclude that her system just wasn't able to recover from her malnourished state. We are grateful for everything the Marine Mammal Center did to try and rehabilitate 'Sweet Rock'. love your photos...and your message is powerful..